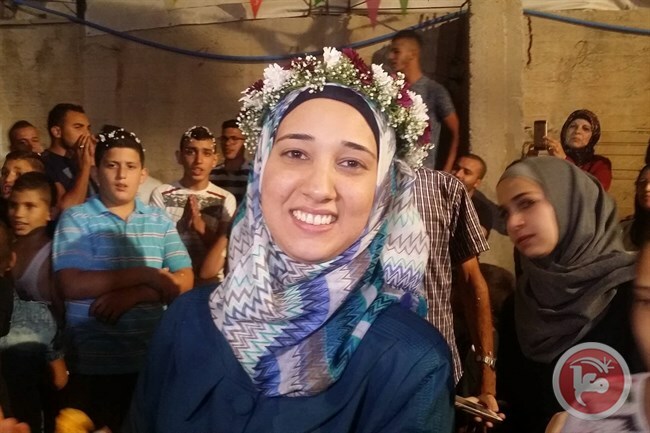 Family members and friends gathered awaited Dweik, 25, outside the gates of HaSharon prison where she was held, before taking her to her home in the Ras al-Amoud area in the Silwan neighborhood of occupied East Jerusalem. Dweik, a journalist for Jerusalem-based news site Shabakat al-Quds [Jerusalem Network], was detained on April 10 in the occupied East Jerusalem neighborhood of Ras al-Amud over alleged “incitement” on Facebook. She was held without charge until Israeli authorities confirmed her indictment in July. Amjad Abu Asab, the head of the Jerusalem Committee for Families of Prisoners, told Ma’an in May that Dweik had been detained after writing a status and sharing an image in support of Palestinians recently killed by Israeli forces. During celebrations after Dweik’s release, Abu Asab highlighted that 10 female Palestinians from East Jerusalem, four of them teenagers, remained in Israeli custody. Israeli authorities, he added, have recently released two East Jerusalem women, Marcelle Zuheir Salayma, 43, and Samiya Mousa Mashahira, 32, after they served 11 months and 8 months in prison respectively. In response to incitement claims against Palestinians, Palestine Liberation Organization (PLO) Secretary-General Saeb Erekat condemned the current Israeli government for its failure to “entrench a culture of peace and coexistence within Israeli society” in a statement in July.